By James Slater: In sad news, it has been reported that former top class heavyweight contender and former two-time world title challenger Carl “The Truth” Williams has passed away. Williams, just 53, lost a long battle with oesophageal cancer, passing away on April 7th. Best known for his losing challenge of a peak Mike Tyson – when Williams was somewhat controversially stopped via TKO, when up and on his feet, in the opening round – Williams fought a number of other notable bouts. His best performance was undoubtedly his close 15-round decision loss to an unbeaten Larry Holmes for the IBF title back in May of 1985. The long-armed Williams used his superb jab to great effect especially, with a good number of people feeling the challenger had done enough to have upset “The Easton Assassin.” Carl also fought notables such as Jesse Ferguson (WTKO10), Mike Weaver (LTKOby2), Bert Cooper (WRTD8), Trevor Berbick (WU12), Tim Witherspoon (LS12), Tommy Morrison (LTKO8) and Frank Bruno (LTKO10). 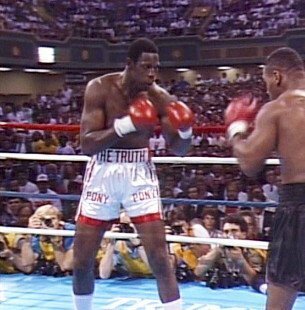 It was the Tyson fight of July 1989 that haunted Williams, however. Decked by a hard left hook in the 1st-round, Williams, who had been taking the fight right to Tyson, beat the count but was deemed unable to carry on by referee Randy Neumann. To his dying day, “The Truth” insisted he could have carried on. Of course, we will never know. A fine boxer, who also enjoyed a stellar amateur career, Williams retired with a 30-10(21) ledger. Carl boxed as a pro from January of 1982 to October of 1997. Condolences go out to his family and friends.